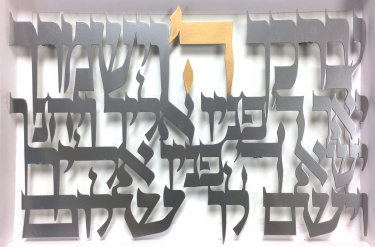 This beautiful wall hanging feaures the well-known Biblical Priestly Blessing: Yevarechecha Hashem Veyishmerecha, Yaer Hashem Panav Elecha Vichuneka, Yisa Hashem Panav Elecha Veyasem Lecha Shalom (" Hashem (The Lord) will bless you and guard you. He will shine His light upon you and grant you grace. Hashem will turn His face towards you and grant you peace") (Numbers 6:24-26). This blessing will look wonderful in a house, office or synagogue. Measures 11" x 15". Made in Israel.